The education amendment has stirred controversy since its creation by the Constitution Revision Commission. A Leon county judge ordered Monday that Amendment 8, the measure that seeks to create a pathway for the state to oversee charter schools and bypass local school boards, be removed from the ballot. Circuit Judge John Cooper wrote in a summary judgement that the amendment's ballot title and summary "fails to inform voters of the chief purpose and effect of this proposal." The judge agreed with the plaintiff, the League of Women Voters, that the ballot language was "misleading" and that the Constitution Revision Commission intentionally bundled three separate education proposals into one "to increase, in its view, their chances of passage." The CRC meets every 20 years to propose amendments to the state Constitution. In drafting Amendment 8 for the November ballot, the commission combined the charter school provision with two others — one that would impose term limits on school board members and another that would constitutionally require civics education in public schools. League of Women Voters Florida president Patricia Brigham called Cooper's ruling a "terrific piece of news to wake up to on a Monday morning." "It's a victory for the people of Florida," she said. "That measure was meant to confuse voters. It did not show the intent was to take away home rule from the districts. … The judge saw right through it." Erika Donalds, a prominent school choice advocate and the CRC commissioner who proposed the amendment, called the ruling "disappointing" and driven by ideology, not the law. "The group suing to remove Amendment 8 from the ballot fundamentally opposes empowering families to choose the education setting that best fits their child," she said. "Despite the bunk they've spread, I hope voters will be able to make their own decision in November. It is disgusting how many misrepresentations the opposition is willing to put forth to block student-centered choice options." Sarah Revell, a spokeswoman for the Florida Department of State, said the state will appeal. The League's lawyer, Ron Meyer, argued that the amendment's ballot summary and title did not let voters know that voting 'yes' could result in massive change to Florida's schools. "It doesn't key you in to the fact that we're taking away control of public schools," Meyer said. "You're obviously saying that there's some class of schools we're going to take away from the locally elected school board, but nowhere is that defined." Meyer cited the discussions during the CRC's drafting of Amendment 8, during which commissioners talked at length about charter schools. The word "charter," he noted, was not included in the amendment text, title or summary. The ballot summary instead said that the state would have permission to "operate, control and supervise public schools not established by the school board." While the Republican-controlled state government has expanded vouchers and charter school options, some local school boards have been unfriendly toward charter schools, which are publicly funded schools managed by private organizations or companies. Meyer also argued that, in bundling the three education proposals together, the CRC was intentionally "putting sparkly things around a pile of mud" to "distract you from the unintelligible part in the middle." On the other side, Blaine Winship, the state's lawyer, argued that "the ballot summary couldn't be clearer." He argued: "The local school boards have a monopoly of the control and supervision (of schools) and that's all that we're trying to get around." Winship said the word "charter" was not included in the amendment language because the types of schools created in the school choice era are constantly evolving. "In another five years," he argued, "who knows what the nomenclature will be?" 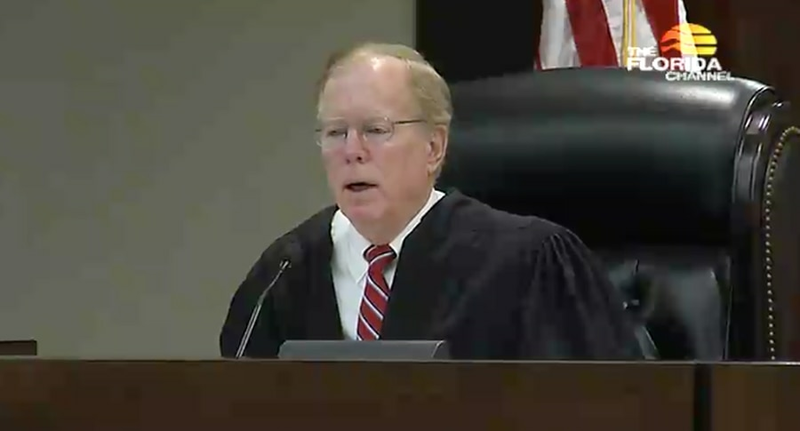 Responding to Judge Cooper, who bemoaned the legal tug of war over who controls schools in Florida, Winship said the amendment settles all of that. "That problem will no longer be coming to your desk if this passes, your honor," he said. The courts must reach a final decision on whether Amendment 8 will be on the ballot by Sept. 4 in order for elections officials to have enough time to print ballots for November. Also at issue is whether the amendment would apply to existing charter schools or only ones established in the future. Neither Meyer nor Winship could answer that, saying that would likely be the next step if the amendment passes. "This is simply giving the voters the chance to make this kind of decision, and then the question of who is establishing these schools — and therefore who has the right to control them — would be something that would presumably be up to legislation," Winship told reporters after the hearing. Monday's ruling is a defeat for school choice advocates like state House Speaker Richard Corcoran, but is only one of several challenges to the CRC's amendments. In state Supreme Court, arguments from the state were due Monday in a separate challenge to six CRC amendments, including Amendment 8. In that case, former chief justice Harry Lee Anstead argues that the amendments are misleadingly bundled. Times Staff Writer Jeffrey S. Solochek contributed. Contact Emily L. Mahoney at [email protected] Follow @mahoneysthename.